Ooh Mummy! 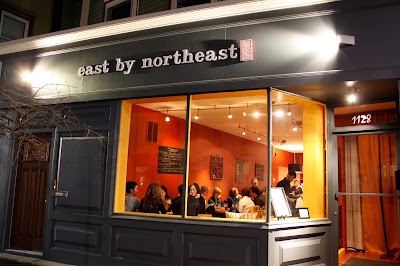 : 12 Course Chef's Tasting Menu at East by Northeast, Cambridge, MA. 12 Course Chef's Tasting Menu at East by Northeast, Cambridge, MA. (Image by Hauteliving) The restaurant was located around Inman Square in a small and intimate space with warm lighting. Service: 4.1/5.0-Servers were friendly and attentive. Armed with a Gilt Boston coupon, we paid $60 for a 7-course tasting menu (variety-wise it was 12) for 2 people, which was obviously a great value. I've heard accolades about ExNe for a while now and have been meaning to try it out, so the gilt coupon was a mailbox godsend. I arrived on time on a busy Saturday evening and within seconds of getting seated, I started to hear gratuitous exclamations from diners around me and repeat orders so I was also getting pretty excited too :) ExNe's food was thoughtful and included lovely small details while incorporating Chinese flavors. Presentation of small plates were also well done instead of your usual, heaping family-style plates. This has got to be the first tasting menu that left me leaving nicely-full and not feeling like a grease monkey after. Kudos to a perfect balance of veggies and meat in each dish. Thanks to the tasting menu, I now know what to order the next time I go! Amuse bouche in a teacup. Pea soup, nori, sesame, and crispy rice. One of my favorite courses. Delicate and creamy, toppings added nice crunch, nuttiness. Beet salad, grapefruit, horseradish, citrus vinaigrette. Refreshing and light. House-made soda-Cilantro and Ginger. There was no obvious cilantro flavor which could be a good or bad thing. I prefer the ginger soda a tad more although both were delicious. Crispy Pork Belly, mantou bread, pickled vegetables. Pickled vegetables were perfect for cutting through the savory richness of pork belly. Good, although I thought that the star anise flavor was a tad overpowering. Warm salad of chicken confit, turnips, romaine, poached egg. Loved the salted chicken confit and sprinkles of lardons. Poached egg imparted a silky finish. A favorite. Hake wonton, seafood broth, chive crepe. This was ok. Skin was too thick; I found it distracting because instead of being able to taste the flakiness of hake in the center, I found myself wrestling the skin. Broth was flavorful. Pork, shrimp, and fiddlehead fern shaomai, carrot and honey puree. Cute fiddleheads on the top. Skin was too thick and stiff for me. I'll take the usual delicate egg wrappers instead. Baby bok choy, fennel, house cured ham, pickled vegetable relish. Aromatic stir-fry that reminded me of home. Simple #winning combination of soy sauce, pepper + thin slices of ham=comfort food. Daikon cake, garlic scapes, housecured bacon, celery, xo sauce. Daikon/Radish cake. this version was too fried (I mean stiff) for my taste but I can see why other people might appreciate it too. I'm used to the delicate tofu-like texture of traditional radish cakes. Hand-rolled short rice noodels with chinese sausage, bok choy, onion broth, asparagus, marinated shiitakes. Soup was starchy reminded me of congee when I viewed it. Tastewise, it was pretty silky and reminded me of the milky Shanghainese wintermelon and ham broth. Handmade thick cut noodles with pork ragout, marinated sunchokes, chilli vinegar. Thick cut noodles (not pictured) that looked like fettucine but thicker (~4 mm). As the noodles tended to be stiff, I would prefer a thinner noodle; width was fine. Vinegar was refreshing. Brown butter sesame cookie, Orange-coconut soup in a teacup. Nose was predominantly orange. Delicate. coconut flavor came as an aftertaste. Sesame cookies were a nice touch.